GE’s Industrial Communications Professional Services offers a range of services and project management capabilities that can be tailored to provide a fully engineered, deployed, and supported system to meet application specific needs. The services and project management offerings are a result of years of experience building multivendor and multi-technology communication networks worldwide. From network planning and systems design to project and program management, GE has a proven track record implementing communication networks for diverse applications. New or modified network design, including IP addressing / subnetting and router configuration. Seamlessly integrate GE and non-GE equipment into a communications network. Set up and install cell-enabled radios to comply with existing contract requirements. Will arrive on-site ready to activate to a customer’s cellular network and servers. Propagation Analysis - For any network design, whether a thousand remotes that need to be monitored or a single point- to-point link, there must be a guarantee that stations can communicate within the service level requirements customers expect. Based on site details including the latitude, longitude, antenna mounting height, a software modeling tool is utilized to predict the wireless coverage for the equipment needed to meet your application requirements. 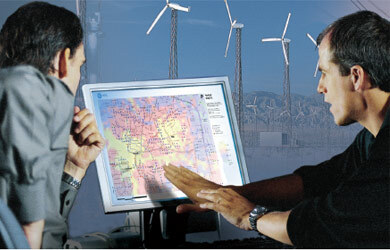 GE has extensive proven field experience in modelling the predicted coverage and propagation analysis reporting. 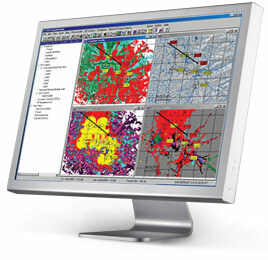 Traffic Modeling - GE analysts work closely with customers to understand their unique application characteristics and traffic patterns. The information is utilized to tailor a model to predict the data traffic flow in the system and provide an optimal network design which utilizes every possible bps available. Based on site details including the latitude, longitude, antenna mounting height, a software modeling tool is utilized to predict the wireless coverage for the equipment needed to meet your application requirements. 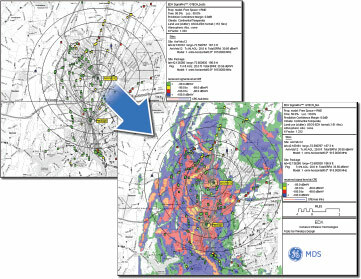 GE has extensive proven field experience in modelling the predicted coverage and propagation analysis reporting. Requisition Engineering - Detailed bills of materials, drawings and instructions will be provided for customers during a project implementation resulting in decreased implementation time and enabling ease of system deployment. Customized Packaged Models – GE’s services team has extensive experience designing, building, installing and commissioning customized packaged models. Model components can include GE and/or 3rd party radios, power supplies, batteries, RTUs and sensors. Customized enclosures are available on request. Onsite System Optimization – GE’s team of expert analysts can conduct studies on existing system sites, examine current setups, and make recommendations for improving network performance. These studies include, but are not limited to, examining the following components: antenna and feedline systems, signal levels and interference, radio configurations, and firmware versions. Capture the strategic objectives of the project. Meet with key stakeholders to collect system requirements which can range from latency and throughput, protocols, coverage areas, security, and so on. Provide customers with a requirements document and initial system concept design. Traffic modeling analysis to support the network throughput and latency needs. Network and security analysis to identify the most appropriate network topology and possible security risks coupled with preventative solutions. Predictive reports, such as propagation coverage, spectrum interference and mitigation plans for potential system failures. On-site audits to validate design assumptions and RF site surveys to verify coverage models. Channel planning to meet spectrum requirements and the creation of a bill of materials and drafting plans to document subsystem components. Detailed system, network management and application design plans based on survey results to create the desired network topology. File regulatory agency required spectrum documentation and procure all necessary equipment. Assemble the network communications devices, conduct factory assessment testing, oversee commissioning of the equipment, and complete network audits to ensure system performance. Prepare knowledge transfer and training materials on system operations and maintenance. Provide on-site training for a smooth transition of the project. Access to an authorized local partner close to your facility for troubleshooting and replacement. A call center with access to technical services for assistance in troubleshooting system issues or general product questions or on-site support if required. 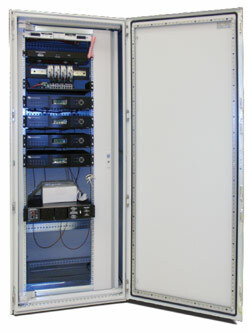 A hosted or on-site network operations center for systems monitoring and diagnosis. Our equipment integration designs are developed with detailed attention to equipment placement and accessibility. Offerings include both standard and custom packages for wireless device integration and networking accessories. Standards-based procedures for equipment integration and testing ensure that wireless systems are robust and future-proof. GE’s Industrial Communications training is offered in a wide variety of platforms and topics to provide flexibility in time, location and skill level. From attendance in on-site classroom courses to virtual course attendance, self-paced e-learning videos and customized courses, GE’s training provides customers with high-quality knowledge to be safe, efficient and successful in industrial wireless communications. This training is ideal for End Users, Application Engineers, System Engineers or anyone who is responsible for the design and maintenance of a wireless data network. Additionally, any management personnel who supervise and delegate the design and maintenance assignments for a wireless network will benefit from these courses. Instructors will remove the mysteries of RF communications by showing students the fundamentals of RF wireless theory, design, and installation. We will also discuss best practices for industry standard applications including Point-to-Point and Point-to-Multipoint radio systems. Students will also learn about the various types of radio interfaces including protocols and network fundamentals. Scheduled training classes are offered at regular intervals throughout the year at the GE MDS Technical Training facility located in Rochester New York, U.S.A. The Technical Training Center contains equipment for hands-on interaction with wireless communications products, test tools, and computers. Training class sizes are kept small so instructors can interact with each student. Students receive comprehensive course manuals, with course notes that include lab exercises. Lentronics Hardened Optical Networks product specialists offer a variety of training courses for both SONET and SDH telecommunications standards. Customers can choose from holding training courses at their own physical location, or having their personnel take training at the GE main office located in Burnaby, just outside of Vancouver, Canada. Courses range from 2 to 5 days in length depending on customer requirements and the depth of training desired. Customized courses can also be provided. To increase the number of employees who can benefit from our training, GE MDS Technical Training offers the option of conducting training courses in person at customer facilities. These on-site courses can be customized to a specific range of topics. Regularly scheduled Regional Training courses are offered at selected locations around North America. Contact your factory representative to discuss course offerings. Click here to request more information on regional training courses.